I'm going to fire my interior designer.... Just kidding. 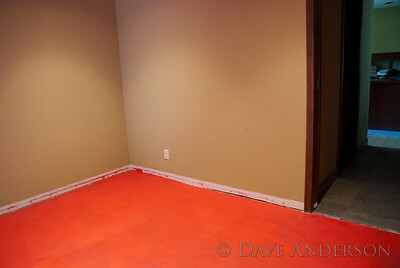 :) Today I sealed the slab in what will become our office. 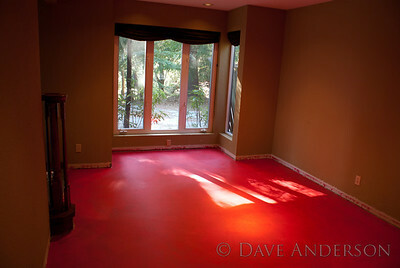 The sealant is RedGard, which looks like Pepto-Bismol going on but dries to a dark red. The green will be replaced with an off-white, "Sand Dollar". I just thought the Pepto-and-green combo was so putrid I had to take a picture. 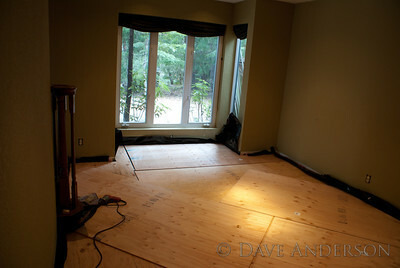 :) After another coat of this, a layer of visqueen will go down followed by the floating plywood subfloor. 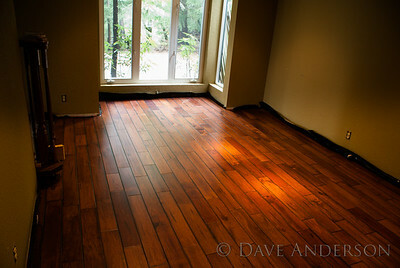 asphalt felt to minimize squeaks, then hardwood. 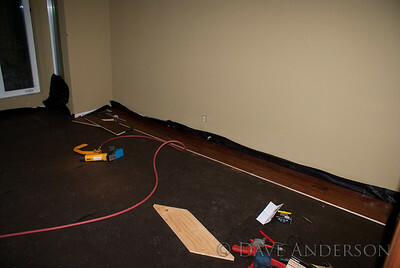 I laid down 6-mil polyethylene which is recommended for floating subfloors despite the superior sealing qualities of RedGard - this layer allows the plywood subfloor to expand and contract without chafing the RedGard membrane. 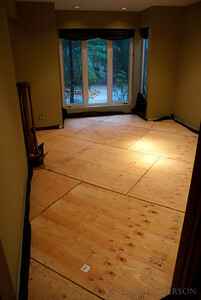 The floating subfloor consists of two layers of 1/2" plywood, with 1/2"-3/4" gaps between sheets to allow for expansion. 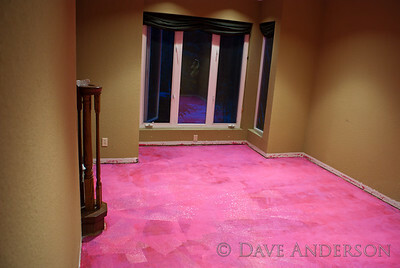 One layer is laid in at a 45° angle to increase the overall dimensional stability of the subfloor, making it the top layer avoids any issues with expansion gaps potentially lining up with the flooring. the layers are screwed together with 3/4" wood screws every 18" or so. 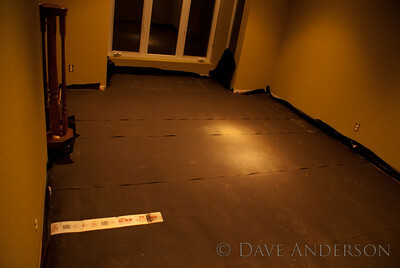 The next layer on top of the plywood is 15lb asphalt felt. 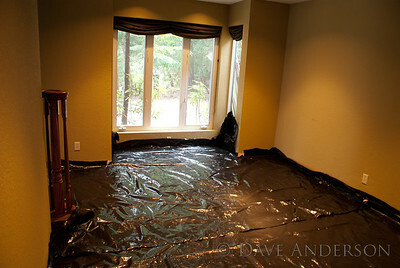 This provides an additional moisture barrier, but mostly it's there to minimize squeaks. 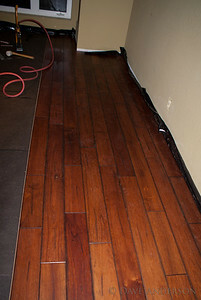 The first course of hardwood is the most critical. 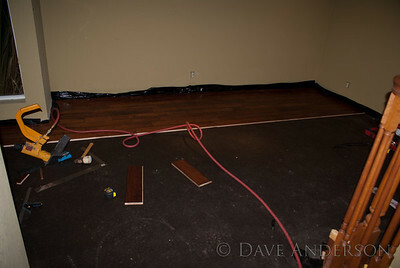 The edge that will mate with the rest of the floor has to be straight and provide the proper 1/4"-3/8" expansion gap from the wall, but walls are not generally straight. I measured the proper distance from the wall at both ends accounting for the gap then snapped a chalk line so I could check the gap all along the wall. If the gap was too narrow or too wide at any point along the wall I would have to cut the wall side of the planks to match any irregularities then move the line accordingly. I lucked out -- this wall is straight enough. 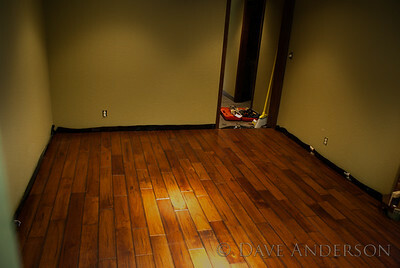 :) The first course has to be face-nailed then all nails countersunk, putty to be applied later. 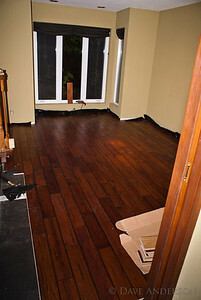 I was able to use the power nailer after this. This is where I left off for the night. Dealing with the wall corner was a bit tricky, that one board had to be notched to give the proper gap and then face-nailed along the edge under the window. 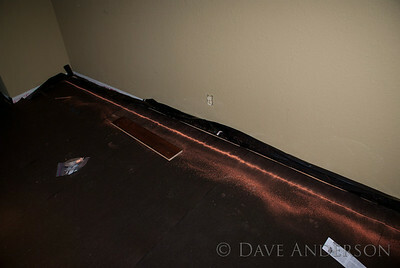 Almost done -- the last bit has to be hand-nailed since the pneumatic stapler won't work so close to the wall. All finished -- time for paint!